Calculates the form factor for a polydisperse spherical particle with a core-shell structure. In this model, the ratio R(core)/R(core+shell) is held constant. 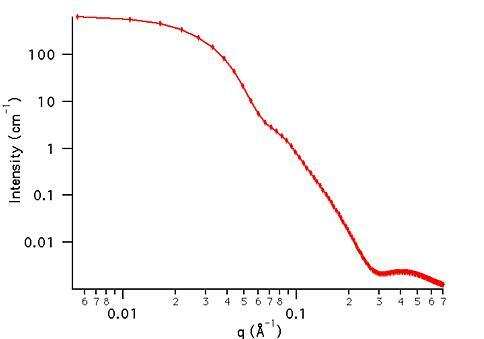 The form factor is normalized by the mean particle volume such that P(q) = scale*<f2>/Vol + bkg, where f is the single particle scattering amplitude and the average < > is over a Schulz distribution of radii. Parameter (polydispersity) is constrained to keep it within its physical limits of (0,1). If a value larger than 1 is entered it is quietly changed to 1 for the calculation. 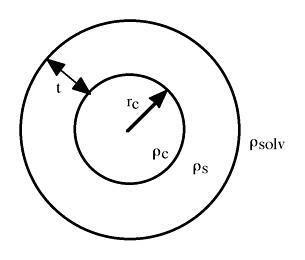 Polydispersity, p = s/Rt, where s2 is the variance of the distribution and Rt is the total particle radius, Rt = Rc +t. For a more complete description of the Schulz distribution, see: J. Hayter in "Physics of Amphiphiles - Micelles, Vesicles and Microemulsions" V. DeGiorgio and M. Corti, Eds. (1983) p. 69.
where and here r denotes the total particle radius, Rc + t, and z is the width parameter of the Schulz distribution, . This example dataset is produced by calculating the PolyCoreShellRatio using 128 data points, qmin = 0.001 Å-1, qmax = 0.7 Å-1 and the above default parameter values.